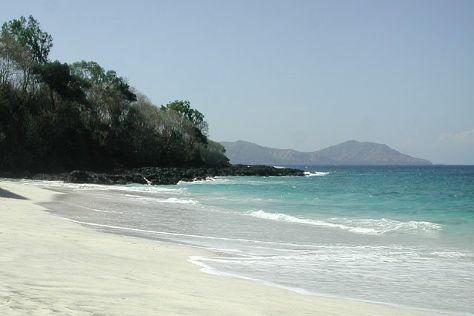 You'll enjoy a bit of beach vacationing at Blue Point Beach and Balangan Beach. You'll explore the less-touristy side of things at Geger Beach Nusa Dua Bali and Bingin Beach. There's much more to do: kick back and relax at Green Bowl Beach, stroll through Dreamland Beach, and get in on the excitement at Jimbaran Hills Activity Valley. To see reviews and tourist information, you can read our Ungasan travel itinerary creator. Rome, Italy to Ungasan is an approximately 23-hour flight. The time zone difference moving from Central European Time to Central Indonesia Time is 7 hours. Traveling from Rome in June, Ungasan is a bit warmer at night with lows of 29°C. Finish up your sightseeing early on the 27th (Tue) so you can travel to Tampaksiring. On the 28th (Wed), explore the world behind art at Agung Rai Museum of Art (ARMA), then contemplate in the serene atmosphere at Saraswati Temple, then delve into the distant past at Mount Kawi, and finally contemplate in the serene atmosphere at Tirta Empul Temple. On the next day, look for all kinds of wild species at Elephant Safari Park and then take in the spiritual surroundings of Gunung Kawi Sebatu Temple. To find traveler tips, maps, photos, and other tourist information, read our Tampaksiring travel itinerary planner. Drive from Ungasan to Tampaksiring in 2 hours. Expect a daytime high around 35°C in June, and nighttime lows around 29°C. Cap off your sightseeing on the 29th (Thu) early enough to go by car to Amed. Kick off your visit on the 30th (Fri): kick back and relax at White Sand Beach, steep yourself in history at Ujung Water Palace, then indulge your taste buds at Two Eka Waroeng, and finally contemplate the long history of USS Liberty Shipwreck. Keep things going the next day: admire the natural beauty at Tirta Gangga, then soothe aching muscles at Apneista Freediving & Yoga, and then enjoy the sand and surf at Jemeluk Beach. To find maps, photos, and tourist information, refer to the Amed trip builder. You can drive from Tampaksiring to Amed in 1.5 hours. Wrap up your sightseeing on the 1st (Sat) to allow time to travel back home.